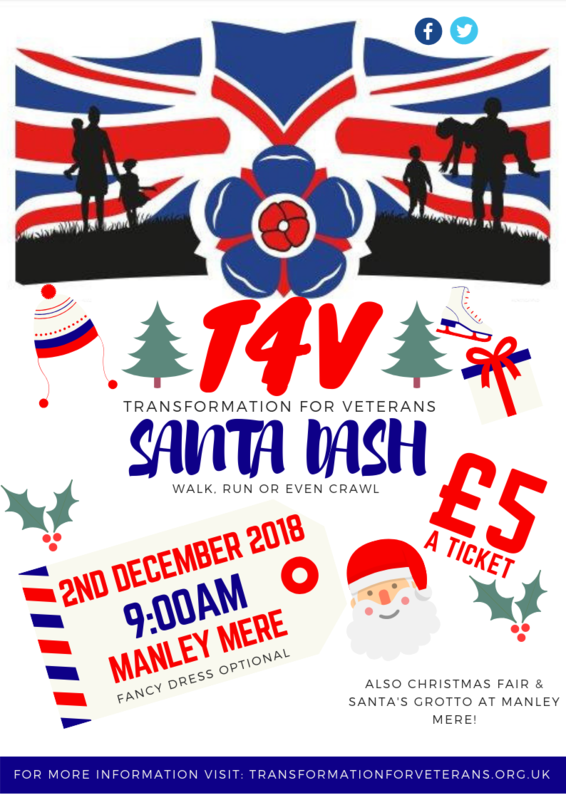 We are excited to announce our Christmas Santa Dash is going to be held on Sunday 2nd December at Manley Mere Manley Ln, Frodsham Cheshire WA6 0PE. It starts at 9am for registration.A short instruction by our very own Paddy ( a Veteran and fitness instructor) who will help you on your way round. He will go through some important information about health and safety, fitness levels and what to expect. Just £5 to enter. All ages are welcome. Walk ,run or crawl-its up to you. All we ask is for you to have FUN doing it!! Sponsorship forms can be sent electronically or posted to you. Call us on 01829 760065 for further details. The sponsorship forms and donations will be collected on the day of the event. No need to worry, if you need more time to collect the donations then arrangements can be made on an individual basis. Imagine yourself amidst a sea of red (Santa’s) the atmosphere, fun ,excitement and merriment…… it will be an experience you will never forget and a memory you will hold fondly. To get you in the Festive mood ………..
We have chosen this beautiful location in the heart of the Cheshire at Manley Mere. Here after the Santa Dash you will have the opportunity to look at their wonderful Christmas market and grab yourself a bargain or treat someone special. Their is also a grotto for the younger ones to explore and enjoy. Theirs a cafe and an adventure trail if you care to be more adventurous and much much more….so what are you waiting for?